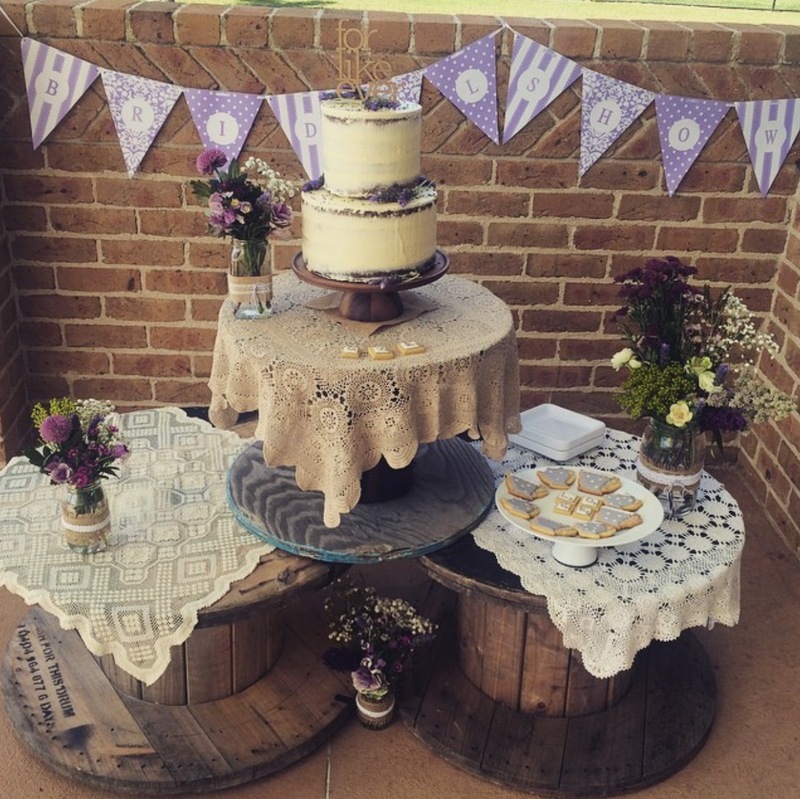 This cake was the inspiration for a very special kitchen tea bridal shower cake for a friend of mine. 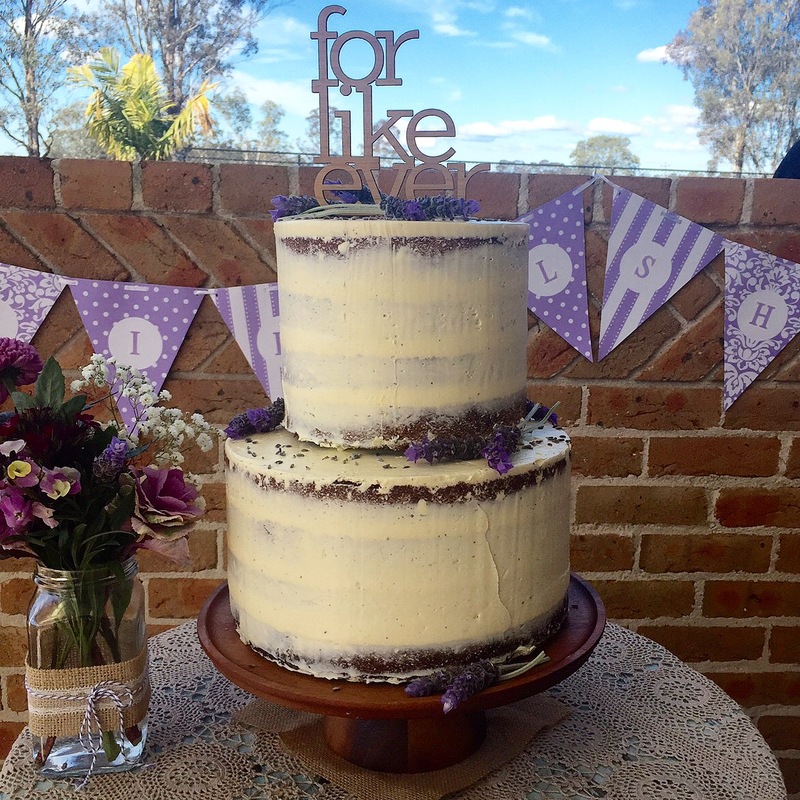 Her theme was rustic & lavender, so this Earl Grey Tea Semi Naked Cake with Lavender Swiss Meringue Buttercream was the perfect fit. Now firstly, I have to apologise for the blogosphere silence of late. A combination of a hectic month of work, plus a dead computer, meant that things kind of came to a halt for a while. But I’ve come out the other side, with a shiny new computer, and this beautiful cake. Now as I said, this cake was the inspiration for a bridal shower cake I recently made, so here’s a look at the actual cake in question, I was pretty chuffed with how it turned out.. 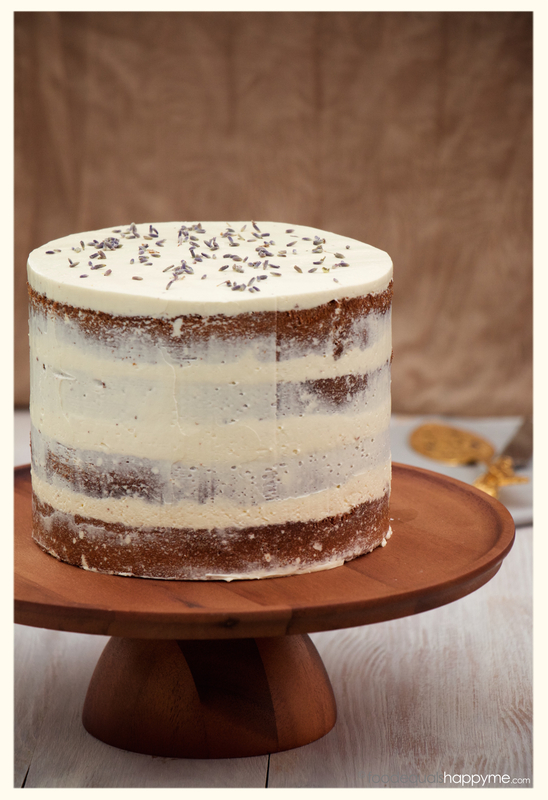 This is not just a special occasion cake though, it is at its very essence just a basic cake with buttercream, but the flavour combo of Earl Grey Tea and Lavender is a revelation. The flavours are delicate & subtle, and together they work just beautifully. 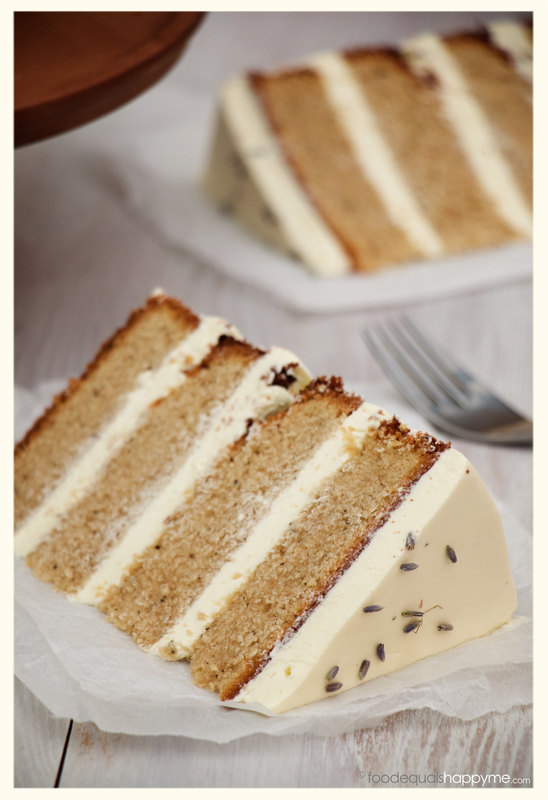 The cake has a light fragrant floral note, and is delicately sweet without being overpowering at all. A must try recipe regardless of the occasion! Preheat oven to 180 degrees celcius. Line the bottom of two 7inch round baking tins with baking paper, and grease the bottom and sides. Place milk in a saucepan over medium heat and bring to a simmer. Turn off the heat then add 4 of the Earl Grey teabags and leave to brew, covered, for 20mins. After 20mins remove the teabags and squeeze out all the liquid. Set the milky tea aside to cool slightly. Place the flour, baking powder, salt, and the contents of the remaining teabag in a bowl, and mix to combine with a whisk. Next place the butter and sugar in a mixing bowl and beat until light and fluffy. Add the eggs one at a time, beating well after each addition. Then add the vanilla extract. With the mixer on low speed add the flour mixture, and milky tea in alternating batches, ending with the flour. Mix until just combined. Divide the mixture between the prepared tins, and place in preheated oven for 45mins or until cooked when tested with a skewer. Leave in tins for 5mins, before turning out onto a wire rack to cool completely. To assemble, level off the cake domes, and cut each cake in half. 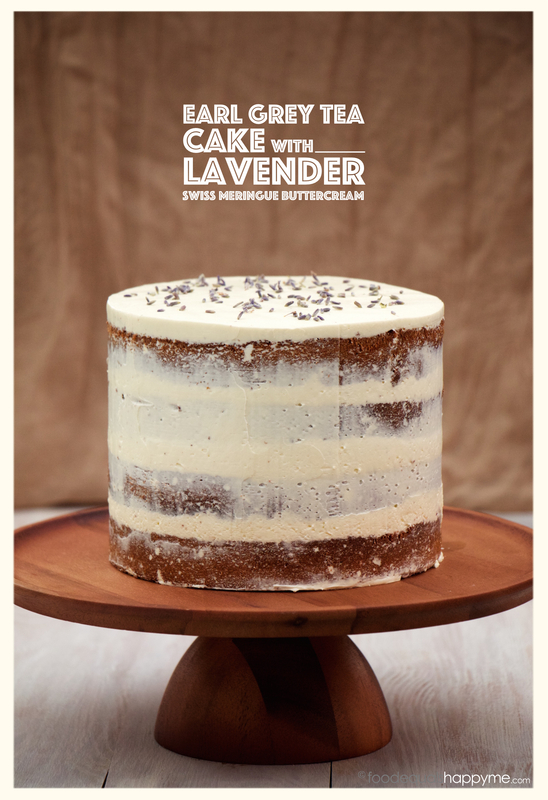 Place a layer of cake on a cake board, and top with a generous layer of the lavender buttercream. Use an offset spatula to smooth the buttercream and make an even layer. Top with another layer of cake and repeat with the buttercream until you have all four layers assembled. 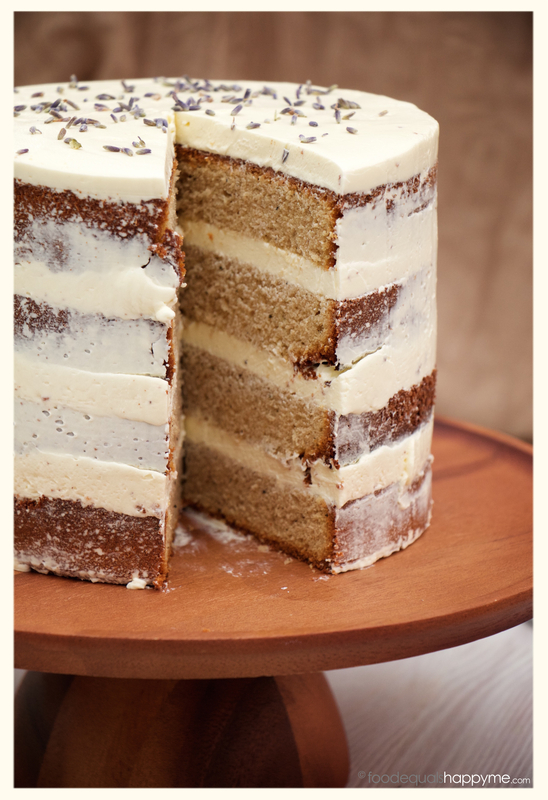 Top the cake with another layer of buttercream and smooth out evenly, letting it extend over the edges. Next, add the buttercream around the sides of the cake until it is completely covered. 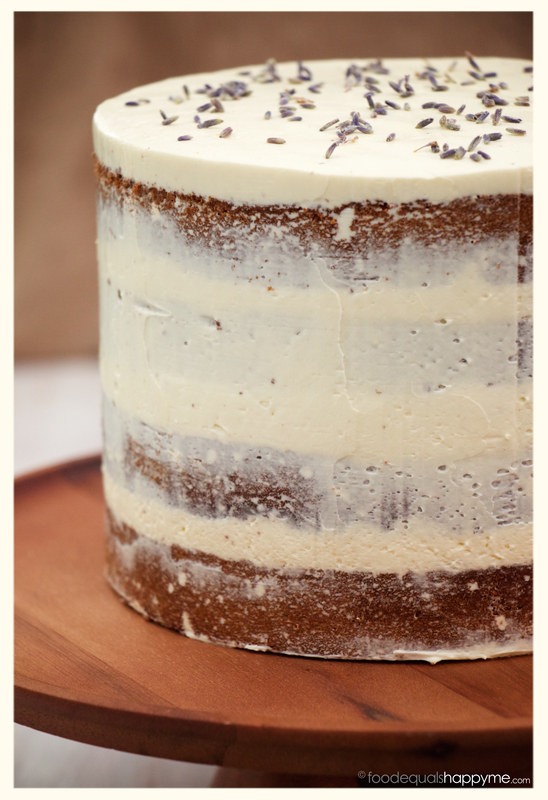 To achieve that semi naked cake look, take an upright palette knife and carefully remove the buttercream around the sides of the cake until it is smooth, and you can see a hint of the cake underneath. Smooth the top edges of the cake by pulling an offset spatula across from the top edge to the center of the cake, repeat all the way around until the top is smooth and flat. 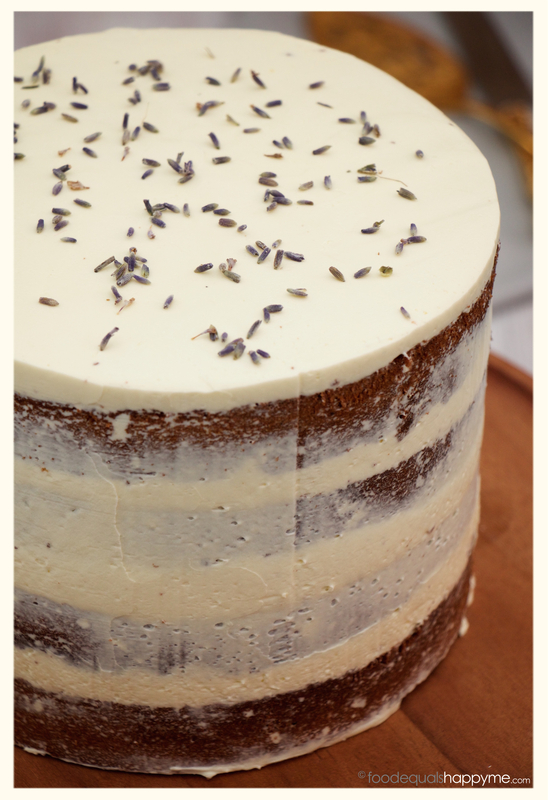 To finish, top the cake with a sprinkle of lavender for decoration. Place the egg whites and sugar in the bowl of an electric mixer and place it over a pot of simmering water. Gently whisk the mixture over the heat until it reaches 150 degrees farenheit on a candy thermometer. Transfer the bowl to the electric mixer, and whisk on high speed for 10mins or until the egg whites are cool and the bowl feels neutral to the touch. Switch over to the paddle attachment, and on the lowest speed, add small cubes of butter one at a time. Once all the butter is added, continue to beat on low speed for another 5-10mins or until the buttercream is thick and silky smooth. Add the vanilla, and the lavender syrup to taste. I like to add it spoonful at a time, tasting as I go until I am happy with the amount of lavender flavour. I probably added around 1/3 cup in total, but you can add as much or as little as you like. Place the water and sugar in a saucepan over a medium heat. Cook stirring until the sugar has dissolved, add the lavender and let it simmer for 1-2mins. Take the pan off the heat and leave to infuse and cool for 20mins. Strain the mixture to remove the lavender. Syrup can be kept in an airtight container in the fridge for 3-4 weeks. If you’re unsure at all about the process of making swiss meringue buttercream, or you think something hasn’t worked properly, check out Sweetapolita’s comprehensive SMB post, it’s super helpful. Will the sugar syrup be too watery and effect the SMB when we mix it in the end? Hi Sam, I just wanted to point out that on your SMB recipe, you said to heat it up to 150 degrees Celsius – I had it on the stove for almost an hour before checking out the link attached to see that it was actually Fahrenheit. Perhaps you should correct this so that it will save others from wasting their time trying to reach 150 degrees Celsius! 🙂 I had mine at almost 100 degrees Celsius and am whipping it now. Hope the buttercream still turns out. Oh no, what a silly mistake I’ve made.. thanks for letting me know I’ll get that updated now! Hope it still worked out for you! How much of your milky tea was left over after brewing? Hi, you should still have roughly 1 cup of milk leftover after brewing. for the buttercream, is it confectioners’ sugar or icing sugar? hi! may I know if the cake is soft and fluffy ?